The last October I started to work at Caffè Nero Bournemouth (UK) as a barista. I didn't expect to have that kind of work, as I moved to the UK to find new opportunities as a graphic designer and develop my career, and to be sincere, I've never worked in a coffee shop before, so it was quite surprising! But more surprising was to discover that I liked the job much more than expected, I really started to enjoy making coffees and trying to learn to do some latte art, and the job gave me the opportunity to have some spare time to work on my own projects and keep learning with online courses. After a couple months I started to think about this idea, that the company has so many recipes, which can be a bit confusing when you get started, and the book that the company gives to the new staff, makes it more complicated. 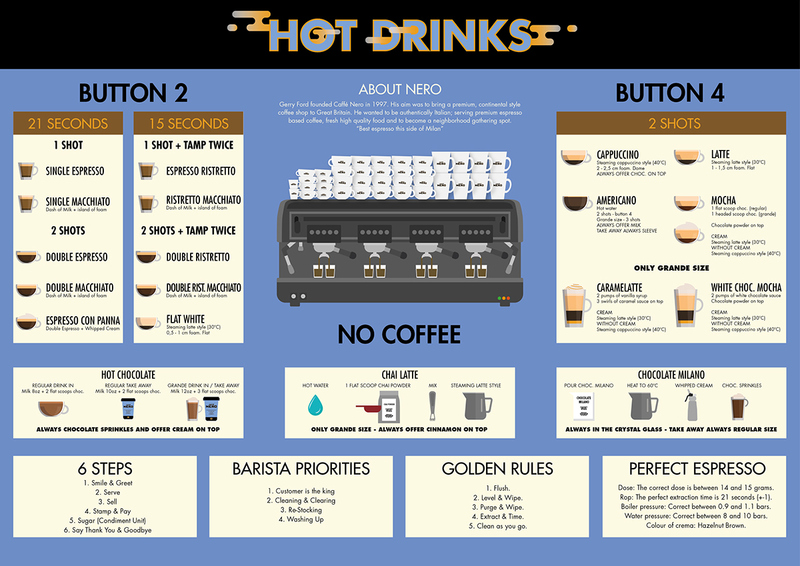 So I decided to create an infographic design to help to all that new staff to learn the recipes easily, with all of them in one single page, organised and in a very visual way, which makes the training easier. I decided to spend some time doing research to keep the branding of the company in the design, so I used their own typography, colours, even i draw the coffee machine as the machine in the store looks like and with the nero cups!